Gentility—what is it? How do we create it and offer it to our little girls? 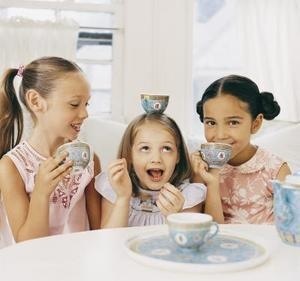 One of the greatest pleasures for young ladies is the tea party. What a beautiful childhood experience it is, and it is so easily created, whether it is in your dining room or in the backyard. Oh, there is nothing like it. The good thing about a tea party is that it can be spontaneous. Set a table with pretty flowers from your backyard. Look in your pantry for store bought cookies and put them on a pretty plate, of course. Have your daughter set out the tea cups and put sugar and milk in the appropriate containers. Now you can have tea together. It is a great time to talk about friendships, clothes, her hockey game next week, or anything that comes to mind. Sit back and enjoy this special moment. For a more elaborate tea and one that is planned in advance, you can serve tea sandwiches, scones, cookies, and of course chocolate in any form. As for the tea, fruited types are very good as are black teas. Provide milk and sugar for your guest. Sliced lemons are nice, too. If your children are not fond of tea yet, lemonade or hot cocoa may be substituted. The most popular teas are English Breakfast and Earl Grey. Both are mild and work with milk and sugar or just lemon. Going out for tea is also a wonderful experience. It is such a fun event to experience with a group of friends. If you have the opportunity to go out for tea, you may see different types of titles to describe the menu offerings. Below, you’ll find several examples that you might encounter. The Cream Tea—This offers scones with clotted cream and lemon curd or jams along with your choice of tea. The Full Tea—The Full tea is a complete menu and includes finger sandwiches, scones, and a variety of sweets along with your choice of tea. A Royal Tea—This offers the menu of a “full tea” along with a glass of champagne. High Tea—“High Tea” is often misused to make the event seem more exclusive. High Tea is not a dainty affair. It is actually a heavy, simple sit-down meal. Back in the day of the Industrial Revolution, this was the meal the workers in the fields and the factories ate. It consisted of heavy meats and cheeses. Afternoon tea is another fabulous ritual for everyone. It is great to plan around a special holiday like Mother’s Day, Easter, or Christmas. Afternoon tea is a magical and beautiful event, and it creates memories that will stay a lifetime. 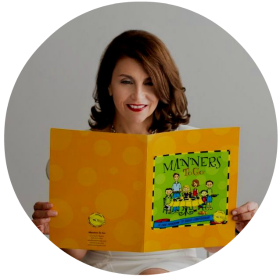 Click here to learn more about manners classes for children. Click here to learn more about Princess-in-Training Parties. Click here to learn more about Tea and Manners with Eloise at The Plaza in New York. Click here to “like” us on Facebook.